Assuring retirement security is a challenge for American workers, for their employers—and for the country’s policymakers. Government policy supports retirement preparedness primarily through two mechanisms: Social Security, which is a mandatory contributory pension for all workers, and tax deferral, which provides incentives for employers to offer and workers to participate in voluntary retirement plans. Yet the combined effect of these two mechanisms is poorly understood—and subject to widespread myths. In a new book, How America Supports Retirement: Challenging the Conventional Wisdom on Who Benefits, economist Peter Brady of the Investment Company Institute challenges the notion of an “upside-down” retirement system that only benefits the wealthy. Brady’s innovative work is the first to use a consistent metric—a tax expenditure estimate—to measure the benefits of both tax deferral and Social Security. It illustrates that higher earners benefit more from tax deferral not because of their higher tax rates, but because the design of Social Security creates a strong incentive for them to defer more of their compensation. In findings that bear directly upon today’s pressing policy debates, Brady demonstrates that the full system of government support for retirement is indeed progressive and warns that tax proposals to limit or fundamentally change tax deferral would actually make the code less fair. Peter J. Brady is a senior economist for retirement and investor research at the Investment Company Institute. 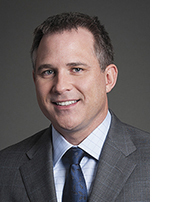 Brady’s research focuses on pensions, retirement savings, and the taxation of capital income. He is currently president of the National Tax Association. Before joining the Institute, Brady worked as a financial economist at the U.S. Department of the Treasury and as a staff economist at the Federal Reserve Board. He holds a PhD in economics from the University of Wisconsin. “The need to fix Social Security solvency and balance our national budget will surely drive U.S. policymakers to get to work on tax reform very soon. For this reason, the time is ripe to focus our attention on “tax expenditures,” which are provisions letting taxpayers deduct, exclude, or defer components of their income from current taxes. 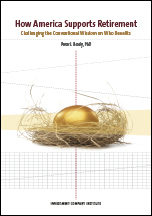 In his fascinating new book, Peter Brady examines how such tax expenditures shape our national retirement system, taking into account both Social Security and company-sponsored retirement plans. “Some analysts argue that our retirement system is regressive, mainly because they focus only on today’s tax deferrals and ignore future tax receipts that pension and Social Security recipients will pay. But by taking a lifecycle perspective, Brady overturns this view. Instead, he shows that the U.S. retirement system is progressive using a coherent lifetime comparison of Social Security taxes and pension contributions paid, with expected benefits received as well as taxes paid in old age. In other words, taking only a short-term perspective on tax deferrals, without looking at lifetime taxes and benefits, will lead policymakers to the wrong conclusions about how our system works.